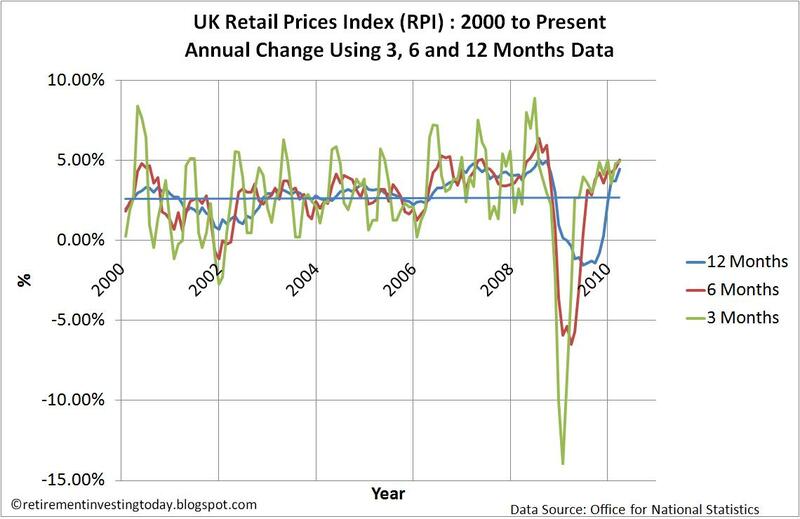 The Office for National Statistics has reported the March 2010 UK Consumer Price Index (CPI) as 3.4% up from 3.0% and the UK Retail Price Index (RPI) as 4.4% (in fact it was 4.449% so almost 4.5%) which is up from 3.7% last month. 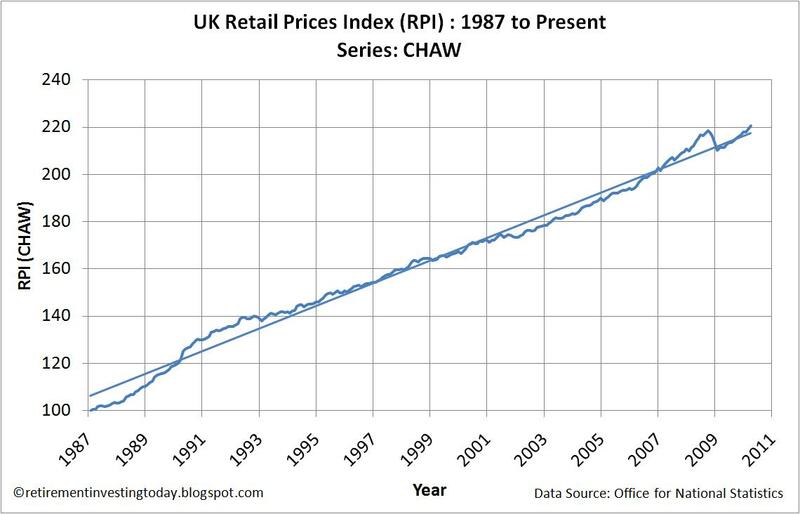 As always my first chart is tracking the CHAW Index which is the RPI including all Items. I focus on the RPI as my National Savings and Investments Index Linked Savings Certificates use the RPI to index from. The current level of the Index remains above the trend line and continues to diverge from trend. 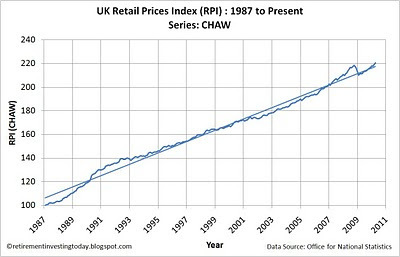 The second chart is again based on the CHAW Index. This chart shows annual figures based on the previous 3, 6 and 12 month’s worth of data. As of February the 12 month figure is 4.4% (as published by the ONS), the 6 month figure is 5.0% annualised up from 4.5% and the 3 month figure is 5.0% annualised also up from 4.8% annualised. So the inflation looks to be bedding itself in nicely. I hope that no regular reader of Retirement Investing Today was surprised by today’s figures. Of course the Bank of England Governor Mervyn King will have to write another letter to the Chancellor as the CPI has now risen above 3.0%. In my opinion he might as well just photocopy the last one and change the date at the top as what he writes will have nothing to do with the real Bank of England strategy. I started suggesting back in January that the Bank of England were going to inflate and I’ve built on that suggestion over the previous months. It now unfortunately looks to be coming true. Now that they have chosen their inflation path let’s see if they can control it or will the bond and gilt markets start to respond by demanding a real return on their investments which will force yields up. This could then force rates for home loans, car loans, credit cards and any other loan for that matter up. That would then force the loan repayments up of the very people who the Bank of England are trying to ‘help’ by inflating away their debts. I’ll be monitoring this and you can also through the metrics I monitor on the right hand side bar – UK Mortgage Rates for example. With average earnings now falling this could then start to put some pressure on the indebted out there. It’s also going to be interesting to watch from here. 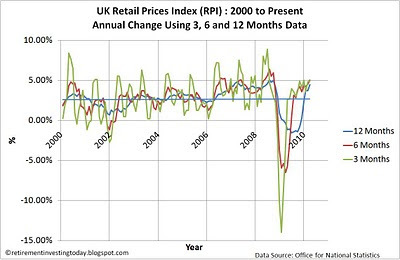 Will they control the inflation or will it start to embed itself into society by for example forcing the British pound (GBP) down which then forces import prices up which then forces inflation up which then forces the pound down ... You get the picture. Or will inflation start to embed itself into salary demands which then will become difficult to stop. The other dangerous game the Bank of England are playing by sitting on their hands is potentially fuelling another asset boom. But I’ve already said plenty about that here.